Forging a new route through an ancient land. From the award-winning director of ON THE LINE comes the unconventional documentary KITTURIAQ. The film unflinchingly follows two men on a 620 km wilderness canoe journey through the vast, remote tundra of the Labrador Plateau- a little-known region of the Canadian North. 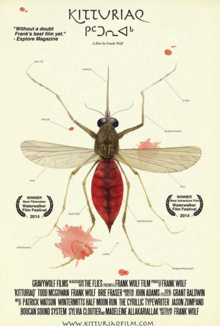 Seen from the perspective of Malina- a mosquito who joins them on the journey- the film brings the viewer intimately into the experience of the expedition. Though the conditions are at times difficult and bludgeoning, the film evokes a joy that is found when the modern world is left behind and an ancient, wild place is embraced. Inuit and Innu people who have lived in this land for thousands of years share their ways with the two adventurers, grounding the journey in history and culture while also alluding to the challenges modern pressures exert on their traditional lifestyles. Set to the music of noted acts like Patrick Watson, Half Moon Run, The Cyrillic Typewriter, and Wintermitts, KITTURIAQ is an exhilarating, cutting-edge entry into the world of modern adventure documentary.